ElectricAccelerator 7.1 hit the streets a last month, on October 10, just six months after the 7.0 release in April. There are some really cool new features in this release, which picks up right where 7.0 left off by adding even more ground-breaking performance features: schedule optimization and Javadoc caching. Here’s a quick look at each. If you study the two runs more closely, you can see how schedule optimization produced this improvement: key jobs, in particular the longest jobs, were started earlier. As a result, idle time in the middle of the build was reduced or eliminated entirely, and the right edge is much less uneven. But the best part? It’s completely automatic: all you have to do is run the build once for emake to learn its performance profile. Every subsequent build will leverage that data to improve build performance, almost like magic. Not convinced? Here’s a look at the impact of schedule optimization on another, much bigger proprietary build (serial build time 18h25m). 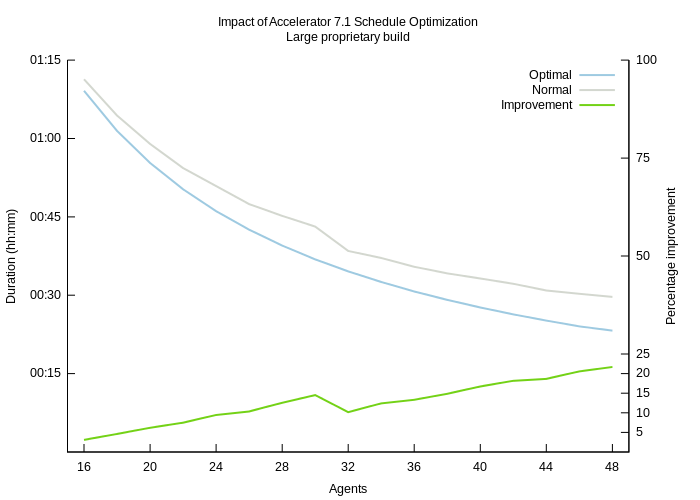 The build is already highly parallelizable and achieves an impressive 37.2x speedup with 48 agents — but schedule optimization can reduce the build duration by nearly 25% more, bringing to total speedup on 48 agents to an eye-popping 47.5x! There’s another interesting angle to schedule optimization though. Most people will take the performance gains and use them to get a faster build on the same hardware. But you could go the other direction just as easily — keep the same build duration, but do it with dramatically less hardware. 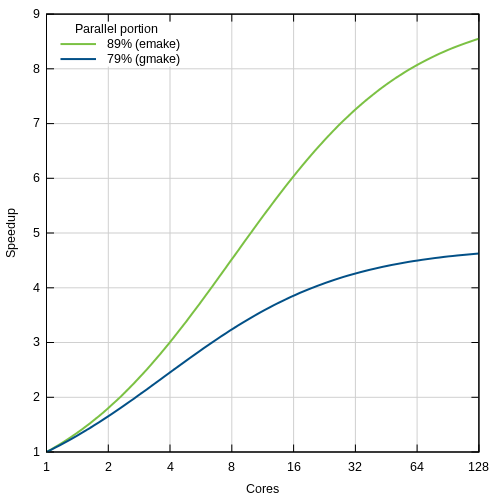 The following graph quantifies the savings, in terms of cores needed to achieve a particular build duration. Suppose we set a target build duration of 30 minutes. 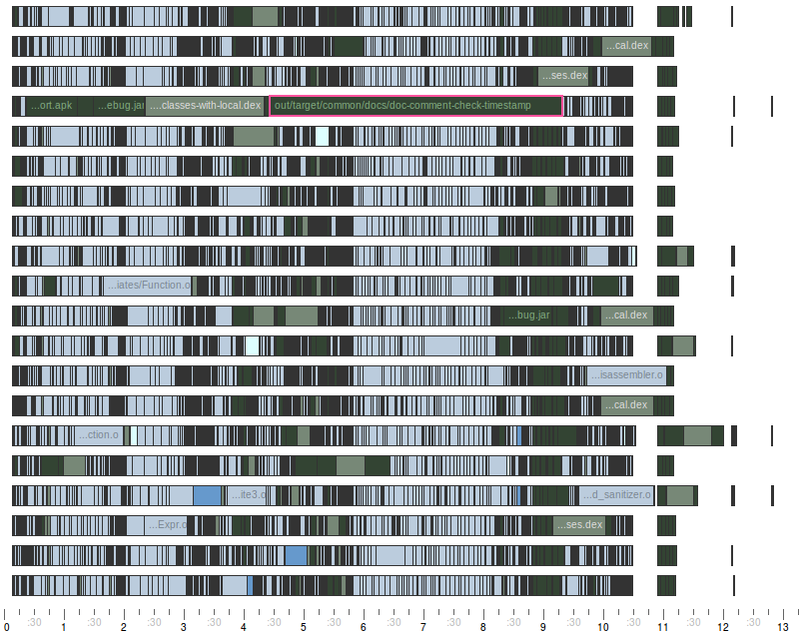 With naive scheduling, we’d need 48 agents to meet that target. With schedule optimization, we need only 38. I’m really excited about schedule optimization, because it’s one of those rare features that give you something for nothing. It’s also been a long time coming — the idea was originally conceived of over three years ago, and it’s only now that we were able to bring it to fruition. Schedule optimization works with emake on all supported platforms, with all emulation modes. It is not currently available for use with electrify. Javadoc caching is available on Solaris and Linux only in Accelerator 7.1. I hope you’re as excited about Accelerator 7.1 as I am — for the second time this year, we’re bringing revolutionary new performance features to the table. But of course our work is never done. We’ve been hard at work on the “buddy cluster” concept for the next release of Accelerator. Hopefully I’ll be able to share some screenshots of that here before the end of the year. We’re also exploring acceleration for Bitbake builds like the Yocto Project. And last, but certainly not least, we’ll soon start fleshing out the next phase of output reuse in Accelerator — caching compiler invocations. Stay tuned! At some point most of you have encountered “the” parallel build problem: a build that works just fine when run serially, but breaks sometimes when run in parallel. You may have read my blog about how ElectricAccelerator automatically solves the classic parallel build problem. Recently I ran into the opposite problem in a customer’s build: a build that “works” when run in parallel, but breaks when run serially! If you’re lucky, this build defect will just cause occasional build failures. If you’re unlucky, it will silently corrupt your build output at random. With traditional GNU make this nasty bug is a nightmare to track down — if you even know that its present! In contrast, the unique features in ElectricAccelerator make it trivial to find the defect — some might even say it’s fun (well, if you’re like me and you enjoy using powerful tools to do sophisticated analysis without breaking a sweat!). Read on to see how ElectricAccelerator makes it easy to diagnose and fix bugs in your build. At the beginning of the build, both reader and writer are started, more-or-less at the same time, because we told gmake to run two jobs at a time. reader has two commands, which are executed serially according to the semantics of make. While the sleep 2 is executing, the echo command in writer runs and completes. When the cat command in reader starts, it succeeds because output is ready-to-go. Here, writer doesn’t get started until after the sleep command has finished — too late to save the cat command from failure. That’s right — the build “succeeded”, because it produced no error messages and exited with a zero exit code. And yet, it produced completely bogus output. Ouch! If you’re using ordinary GNU make, you’re in for a world of hurt with a problem like this. First, the only way to consistently reproduce the problem is to run the entire build serially — of course that probably takes a long time, or you wouldn’t have been using parallel builds in the first place. Second, there are no diagnostics built into gmake that could help you identify which job produces output. One option is to use strace to monitor filesystem accesses, but that will generate a mountain of data in a not-very-usable format. Plus, it imposes a substantial performance penalty — on top of the hit you’d already take for running the build serially. Yuck! Consistent results: emake mimics serial execution with gmake, so you’ll always get a consistent result with this build. That means it will fail, the same way, every time, which means you’ll discover the problem immediately after it is introduced, not months or years later after it has become nearly impossible to tell which Makefile change introduced the defect. Parallel speed: emake’s results match those of a serial gmake build, but its performance is more like that of a parallel gmake build — better, in most cases. Annotated build logs: emake can generate an XML-enhanced version of the build output log which contains a record of every file accessed by every job in the build. This annotation file can easily be mined to identify pairs of jobs where the reader preceeds the writer. # If this is a read operation, note the job that did the read. # the file, we've found a read-before-write instance. # After we see a write on this file we can move on to the next. # For each instance, print the filename, the writer, and each reader. append result "WRITER  :\n  $writerName ($writerFile:$writerLine)\n"
append result "  $readerName ($readerFile:$readerLine)\n"
Voila! We’ve pinpointed the problem with barely 50 lines of code (including comments!). You can even see a solution: add writer as a prerequisite of reader, on line 3 of Makefile. As you’ve seen, ElectricAccelerator makes it easy to identify and correct build problems that would otherwise be nearly impossible to root out. Hopefully you also see that this is just the tip of the iceberg — with consistent fast builds and the treasure trove of data available in annotation files, what other analysis could you do? To get started, you can download a free trial of ElectricAccelerator Developer Edition and check out the reports in ElectricInsight. You can also download the Read Before Write report for ElectricInsight from my GitHub repo. If you come up with something cool, tell me about it in the comments! In fact, even on this highly optimized, parallel-friendly build, Accelerator 7.0 is faster than GNU make, on the same number of cores. On a 48-core system gmake -j 48 builds Android 4.1.1 in 15 minutes. Accelerator 7.0 on the same system? 12 minutes, 21 seconds: 17.5% faster. Read on for more information about the key new features in ElectricAccelerator 7.0. In this makefile you can easily see that the dependency between foo and bar is superfluous. Unfortunately GNU make is shackled by the dependencies specified in the makefile and is thus obliged to run the two jobs serially. In contrast, with dependency optimization enabled emake can detect this inefficiency and ignore the unnecessary dependency — so foo and bar will run in parallel. Obviously you could trivially fix this simple makefile, but in real-world builds that may be difficult or impossible to do manually. For example, in the Android 4.1.1 build, there are about 2 million explicitly specified dependencies in the makefiles. For a typical variant build, only about 300 thousand are really required: over 85% of the dependencies are unnecessary. And that's in the Android build, which is regarded by some as a paragon of parallel-build cleanliness — imagine the opportunities for improvement in builds that don't have Google's resources to devote to the problem. To enable dependency optimization in your builds, add --emake-optimize-deps=1 to your emake command-line. The first build with that option enabled will "learn" the characteristics of the build; the second and subsequent builds will use that information to improve performance. A common complaint with large build systems is incremental build performance — specifically, the long lag between the time that the user invokes make and the time that make starts the first compile. Some have even gone so far as to invent entirely new build tools with a specific focus on this problem. Parse avoidance delivers similar performance gains without requiring the painful (perhaps impossible!) conversion to a new build tool. For example, a "no touch" incremental build of Android 4.1.1 takes close to 5 minutes with Accelerator 6.2, but only about 30 seconds with Accelerator 7.0. On complex builds, a large portion of the lag comes from parsing makefiles. The net result of that effort is a dependency graph annotated with targets and the commands needed to generate them. The core idea underpinning parse avoidance is the realization that we need not redo that work on every build. 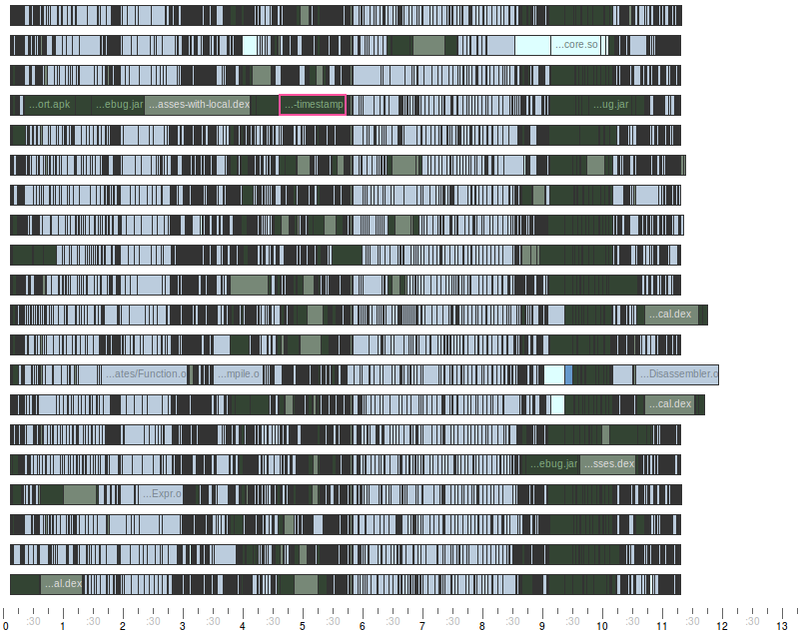 Most of the time, the dependency graph, et al, is unchanged from one build to the next. Why not cache the result of the parse and reuse it in the next build? So that's what we did. To enable parse avoidance in your builds, add --emake-parse-avoidance=1 to your emake command-line. The first build with that option will generate a parse result to add to the cache; the second and subsequent builds will reload the cached result in lieu of reparsing the makefiles from scratch. Order-only prerequisites in NMAKE emulation mode. GNU make introduced the concept of order-only prerequisites in 3.80. With this release we've extended our NMAKE emulation with the same concept. Enhancements to electrify. The biggest improvement is the ability to match full command-lines to decide whether or not a particular command should be executed remotely (Linux only). Previously, electrify could only match against the process name. In my opinion, Accelerator 7.0 is the most exciting release we've put out in close to two years, with truly ground-breaking new functionality and performance improvements. It's not often that you can legitimately claim double-digit percentage performance improvements in a mature product. I'm incredibly proud of my team for this accomplishment. With that said: there's always room to do more. We're already gearing up for the next release. The exact release content is not yet nailed down, but on the short list of candidates is a new job scheduler, to enable still better performance; "buddy cluster" facilities, to allow the use of Accelerator without requiring dedicated hardware; and possibly some form of acceleration for Maven-based builds. Let's go! Recursive make is one of those things that everybody loves to hate. It’s even been the subject of one of those tired “… Considered Harmful” diatribes. According to popular opinion, recursive make will sap performance from your build, make it nigh impossible to ensure correctness in parallel builds, and may render the user sterile. OK, maybe not that last one. But seriously, the arguments against recursive make are legion, and deeply entrenched. The problem? They’re flawed. That’s because they assume there’s only one way to implement recursive make — when the submake is invoked, the parent make is blocked until the submake completes. That’s how almost everybody does it. But in Electric Make, part of ElectricAccelerator, we developed a novel new approach called non-blocking recursive make. This design eliminates the biggest problems attributed to recursive make, without requiring a painful and costly conversion of your build system to non-recursive make. Each submake compiles a bunch of source files, then links them together into a library (util) or an executable (client and server). The only actual dependency between the work in the three make instances is that the client and server programs need the util library. Everything else is parallelizable, but with traditional recursive make, gmake is unable to exploit that parallelism: all of the work in the util submake must finish before any part of the client submake begins! If you’re familiar with Electric Make, you already know how it solves the first half of the recursive make problem: conflict detection and correction. I’ve written about conflict detection before, but here’s a quick recap: using the explicit dependencies given in the makefiles and information about the files accessed as each target is built, emake is able to dynamically determine when targets have been built too early due to missing explicit dependencies, and rerun those targets to generate the correct output. Electric Make can ensure the correctness of parallel builds even in the face of incomplete dependencies, even if the missing dependencies are between targets in different submakes. That means you need not serialize entire submakes to ensure the build will run correctly in parallel. Like an acrobat’s safety net, conflict detection allows us to consider solutions to the other half of the problem that would otherwise be considered risky, if not outright madness. In fact, our solution would not be possible without conflict detection: non-blocking recursive make. This is analogous to the difference between blocking and non-blocking I/O: rather than waiting for a recursive make to finish, emake carries on executing subsequent commands in the build immediately, including other recursive makes. Conflict detection ensures that only the commands in each submake which require serialization are executed sequentially, so the build runs as quickly as possible, but the final build output is identical to a serial build. On the backend, non-blocking recursive make is handled by conflict detection — the jobs from the recursive make are checked for conflicts in the serial order defined by the makefile structure. Any issues caused by aggressively running recursive makes early are detected during the conflict check, and the target that ran too early is rerun to generate the correct result. On the frontend, emake uses a strategy that is at once both brilliant in its simplicity, and diabolical in its trickery. It starts with an environment variable. When emake is invoked recursively, it checks the value of EMAKE_BUILD_MODE. If it is set to node, emake runs in so-called stub mode: rather than executing the submake (parsing the makefile and building targets), emake captures the invocation context (working directory, command-line and environment) in a file on disk, prints a “magic” string and exits with a zero status code. The file containing the invocation context is identified by a second environment variable, ECLOUD_RECURSIVE_COMMAND_FILE. The Accelerator agent (which handles invoking commands on behalf of emake) checks for the presence of that file after every command that is run. If it is found, the agent relays the content to the toplevel emake invocation, where a new make instance is created to represent the submake invocation. That instance comes with it’s own parse job of course, which gets inserted into the queue of jobs. Some (short) time later, the parse job will run, discover whatever work must be run by the submake, and create additional rule jobs. With non-blocking recursive make, the submake has not actually executed when the “echo After util” command runs. If emake doesn’t account for that reordering, both the “Before” and “After” messages will appear before any of the output from the submake. EMAKE_FNORD allows emake to “stitch” the output together so the build log matches a serial log. Conflict detection and non-blocking recursive make together solve the main problems associated with recursive make. But there are a couple scenarios where non-blocking recursive make does not work well. Fortunately, these are uncommon in practice and easily addressed. In this case, the workaround is to explicitly force emake to run in so-called “local” mode, which means emake will handle the recursive make invocation as a blocking invocation, just like traditional make would. You can force emake into local mode by adding EMAKE_BUILD_MODE=local to the environment before the recursive make invocation. Here the build assumes that the output files generated by the submake will be available for use immediately after the submake completes. Obviously this is not the case with non-blocking recursive make — when the invocation of $(MAKE) -C sub foo completes, only the submake stub has actually finished. The build products will not be available until after the submake is actually processed later. Note that in this build both the recursive make invocation and the commands that use the build products from that invocation are treated as a single command from the perspective of make: make actually invokes the shell, and the shell then runs the recursive make and cp commands. With that trivial change, emake is able to treat the cp as a continuation job, which can be serialized against the completion of the recursive make as needed. For years, people have heaped scorn and criticism on recursive make. They’ve nearly convinced everybody that even considering its use is automatically wrong — you probably can’t help feeling a little bit guilty when you use recursive make. But the reality is that recursive make is a reasonable way to structure a large build. You just need a better make. With conflict detection and non-blocking recursive make, Electric Make has fixed the problems usually associated with recursive make, so you can get parallel builds that are both fast and correct. Give it a try! If you run this build without a history file, using at least two agents, you will see a conflict on the continuation job that executes the cp foo bar command, because that job is allowed to run before the job that creates foo in the recursive make invocation. After one run of course, emake records the dependency in history, so later builds don’t make the same mistake. This situation is a bit different from the symlink conflict I showed you previously. In that case, it was not obvious what caused the usage that triggered the conflict (the GNU make stat cache). In this case, it’s readily apparent: the continuation job reads (or attempts to read) foo before foo has been created. That’s pretty much a text-book example of the sort of thing that causes conflicts. What’s surprising in this example is that the continuation job is not automatically serialized with the recursive make that precedes it. In a very real sense, a continuation job is an artificial construct that we created for bookkeeping reasons internal to the implementation of emake. Logically we know that the commands in the continuation job should follow the commands in the recursive make. In fact it would be absolutely trivial for emake to just go ahead and stick in a dependency to ensure that the continuation is not allowed to start until after the recursive make finishes, thereby avoiding this conflict even when you have no history file. Given a choice between two strategies that both produce correct output, emake uses the strategy that produces the best performance in the general case. Hopefully you agree that the ideal execution of this build would have both foo and bar running in parallel. Forcing the continuation job to be serialized with the preceding recursive make would choke the performance of this build. And just in case you’re thinking that emake could be really clever by looking at the commands to be executed in the continuation job, and only serializing “when it needs to”: it can’t. First, that would require emake to implement an entire shell syntax parser (or several, really, since you can override SHELL in your makefile). Second, even if emake had that ability, it would be thwarted the instant the command is something like my_custom_script.pl — there’s no way to tell what will happen when that gets invoked. It could be a simple filesystem access. It could be a recursive make. It could be a whole series of recursive makes. Even when the command is something you think you recognize, can emake really be sure? Maybe cp is not our trustworthy standard Unix cp, but something else entirely. Use a good history file from a previous build. This is the simplest solution. You’ll only get conflicts in this build if you run without a history file. Either of these will eliminate the conflict from your build. Specifically, if you have at least two agents, emake will report a conflict between symlink_to_foo and foo, indicating that symlink_to_foo somehow read or otherwise accessed foo during execution! But ln does not access the target of a symlink when creating the symlink — in fact, you can even create a symlink to a non-existent file if you like. It seems obvious that there should be no conflict. What’s going on? To understand why this conflict occurs, you have to wrap your head around two things. First, there’s more going on during a gmake-driven build than just the commands you see gmake invoke. That causes the usage that provokes the conflict. Second, emake considers a serial gmake build the “gold standard” — if a serial gmake build produces a particular result, so too must emake. That’s why the additional usage must result in a conflict. In this case, the usage that triggers the conflict comes from management of the gmake stat cache. This is a gmake feature that was added to improve performance by avoiding redundant calls to stat() — once you’ve stat()‘d a file once, you don’t need to do it again. Unless the file is changed of course, which happens quite a lot during a build. To keep the stat cache up-to-date as the build progresses, gmake re-stat()‘s each target after it finishes running the commands for the target. So after the commands for symlink_to_foo complete, gmake stat()‘s symlink_to_foo again, using the standard stat() system call, which follows the symlink (in contrast to lstat(), which does not follow the symlink). That means gmake will actually cache the attributes of foo for symlink_to_foo. To ensure compatibility with gmake, emake has to do the same. In Accelerator parlance, that means we get read usage on symlink_to_foo (because you have to read the symlink itself to determine the target of the symlink), and lookup usage on foo. The lookup on foo causes the conflict, because, of course, you will get a different result if you lookup foo before the job that creates it than you would get if you do the lookup after that job. Before the job, you’ll find that foo does not exist, obviously; after, you’ll find that it does. @echo newer prereqs are: $? You can plainly see the difference: in the parallel build gmake stat()‘s symlink_to_foo before foo exists, so the stat cache records symlink_to_foo as non-existent. Then when gmake generates the value of $? for reader, symlink_to_foo is excluded, because non-existent files are never considered newer than existing files. In the serial build, gmake stat()‘s symlink_to_foo after foo has been created, so the stat cache indicates that symlink_to_foo exists and is newer than reader, so it is included in $?. Hopefully you see now both what causes the conflict, and why it is necessary. The conflict occurs because of lookup usage generated when updating the stat cache. The conflict is necessary to ensure that the build output matches that produced by a serial gmake — the “gold standard” for build correctness. If no conflict is declared, there is the possibility for a detectable difference in build output compared to serial gmake. However, you might be thinking that although it makes sense to treat this as a conflict in the general case, isn’t it possible to do something smarter in this specific case? After all, the orignal example build does not use $?, and without that there isn’t any detectable difference in the build output. So why not skip the conflict? The answer is simple, if a bit disappointing. In theory it may be possible to elide the conflict by checking to see if the symlink is used by a later job in a manner that would produce a detectable difference (for example, by scanning the commands for subsequent targets for references to $? ), but in reality the logistics of that check are daunting, and I’m not confident that we could guarantee correct behavior in all cases. Use a good history file from a previous build. This is the most obvious solution. You’ll only get conflicts if you run without a history file. Any one of these will eliminate the conflict from your build, and you’ll enjoy fast and correct parallel builds. In a previous article I covered the basic conflict detection algorithm in ElectricMake. It’s surprisingly simple, which is one of its strengths. But if ElectricMake strictly adhered to the simple definition of a conflict, many builds would be needlessly serialized, sapping performance. Over the years we’ve made a variety of tweaks to the core algorithm, adding support for special cases to improve performance. Here are some of those special cases. Suppose that job D, which falls between C and E in serial order, runs before any other jobs finish. At runtime, D sees the initial version, but strictly speaking, if it had run in serial order it would have seen the version created by job C. But the two versions are functionally identical — both indicate that the file does not exist. From the perspective of the commands run in job D, there is no detectable difference in behavior regardless of which of these two versions was used. Therefore emake can safely ignore this conflict. Suppose that the directory does not exist when the build starts, and several jobs that employ this idiom start at the same time. At runtime they will each see the same filesystem state — namely, that the output directory does not exist. Each job will therefore create the directory. But in reality, had these jobs run serially, only the first job would have created the directory; the others would have seen the version created by the first job, and done nothing with the directory themselves. According to the simple definition of a conflict, all but the first (serial order) job would be considered in conflict. For builds without a history file expressing the dependency between the later jobs and the first, the performance impact would be disastrous. Prior to Accelerator 5.4, there were two options for avoiding this performance hit: use a good history file, or arrange for the directories to be created before the build runs. Accelerator 5.4 introduced a refinement to the conflict detection algorithm which enables emake to suppress the conflict between jobs that both attempt to create the same directory, so even builds with no history file will not get conflicts in this scenario, without sacrificing correctness. (NB: you need not take special action to enjoy the benefits of this improvement). The problem of course is that you’ll get conflicts if you try to run all of these jobs in parallel. Suppose all three jobs, A, B and C start at the same time. They will each see the initial version, an empty file, but if run serially, only A would have seen that version. B would have seen the version created by A; C would have seen the version created by B. Since emake now knows that the jobs are not dependent on the prior content of the file, it need not declare conflicts between the jobs, even if they run in parallel. As emake commits the modifications from each job, it stitches the fragments together into a single file, with each fragment in the correct order relative to the other pieces. Directory read operations are interesting from the perspective of conflict detection. Consider: what does it mean to read a directory? The directory has no content of its own, not in the way that a file does. Instead, the “content” of a directory is the list of files in that directory. To check for conflicts on a directory read, emake must check whether the list of files that the reader job actually saw matches the list that it would have seen had it run in serial order — in essence, doing a simple conflict check on each of the files in the directory. That’s conceptually easy to do, but the implications of doing so are significant: it means that emake will declare a conflict on the directory read anytime any other job creates or deletes any file in that directory. Compare that to reads on ordinary files: you only get a conflict if the read happens before a write operation on the same file. With directories, you can get a conflict for modifications to other files entirely. This is particularly dangerous because many tools actually perform directory reads under-the-covers, and often those tools are not actually concerned with the complete directory contents. For example, a job that enumerates files matching *.obj in a directory is only interested in files ending with .obj. The creation of a file named foo.a in that directory should not affect the job at all. stat current to get its inode number. read parent until an entry matching that inode number is found. Repeat starting with step 4. By following this algorithm the program can construct an absolute path for the current working directory. The problem is that the program has a read operation on every directory between the current directory and the root of the filesystem. If emake strictly adhered to conflict checking on directory reads, a job that used such a tool would be serialized against every job that created or deleted any file in any of those directories. For this reason, emake deliberately ignores conflicts on directory read operations by default. Most of the time this is safe to do, surprisingly — often tools do not need a completely accurate list of the files in the directory. And in every case I’ve seen, even if the tool does require a perfectly correct list, the tool follows the directory read with reads of the files it finds. That means that you can ensure correct behavior by running the build one time with a single agent, to ensure the directory contents are correct when the job runs. That run will produce history based on the file reads, so subsequent builds can run with many agents and still produce correct results. Starting with Accelerator 6.0, you can also use –emake-readdir-conflicts=1 to force emake to honor directory read conflicts. Getting parallel builds that are fast is easy: just add -j to your make invocation. Getting parallel builds that are both fast and reliable is another story altogether. As you’ve seen, the core conflict detection algorithm in ElectricMake is simple, but after many years and hundreds of thousands of builds, we’ve enhanced that simple algorithm in a variety of special cases to provide even better performance. Future releases of ElectricAccelerator will include even more refinements to the algorithm.